After two years of failed negotiations with the school district, Oakland’s teachers could be the nation’s next group of educators to go on strike. At schools all across Oakland, public school teachers are filling out paper ballots asking them whether they authorize their union, the Oakland Education Association (OEA), to call for a strike. The voting ends on Friday—at which point, OEA leadership will announce whether they have their membership’s support to declare a strike. 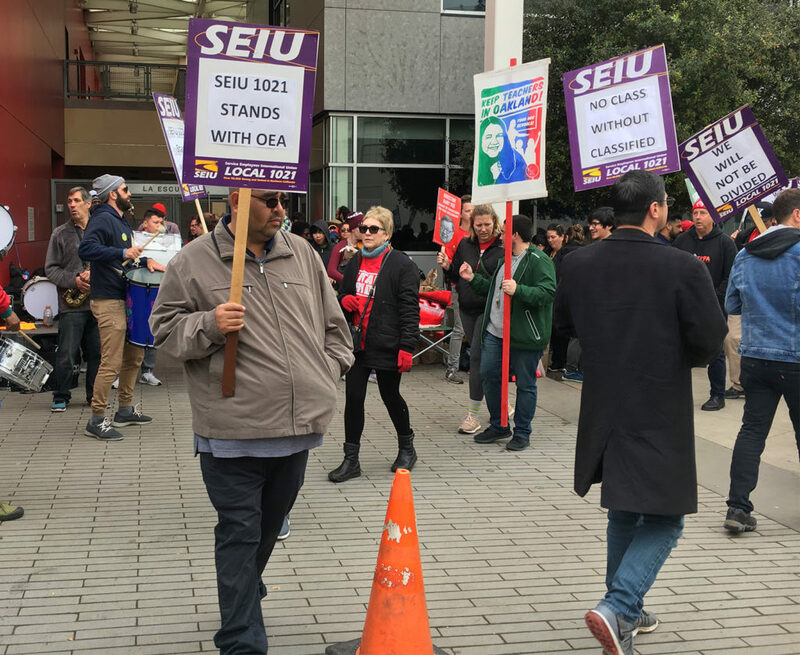 The vote will not result in an immediate strike, but rather grants the union’s executive board the authority to legally call for one, if ongoing negotiations with the Oakland Unified School District (OUSD) fail to produce a new contract. Oakland teachers have been working without a contract since July, 2017. Throughout the negotiations, the union and the district have remained far apart on two critical issues: teacher pay and class size. 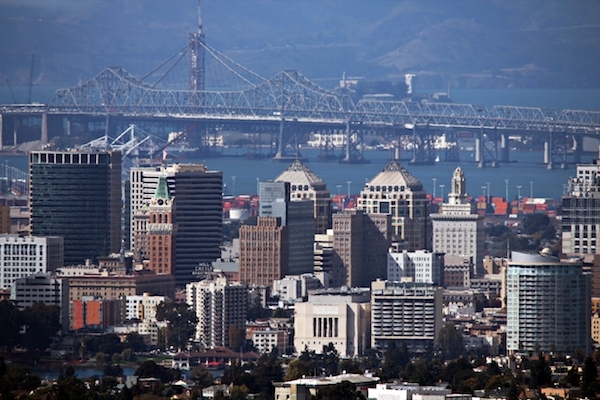 While both sides agree that Oakland public school teachers deserve a raise—they rank near the bottom of the local pay scale, compared to teachers in surrounding districts—the two sides have to reach an agreement on its size. In the latest round of negotiations, the union asked for a 12 percent raise over the course of the next three school years. The district offered a 5 percent raise over that time period. Similarly, both sides have offered some class size reductions, but don’t agree on the specifics. The OUSD offered to reduce fourth and fifth grade class sizes by one student at schools with high percentage of students who are either English learners, foster youth or receive free or reduced lunch (which indicates that they come from a low-income household). The district also offered to shrink the size of physical education and fine arts classes by one student. Meanwhile, the union asked to reduce all elementary school class sizes by one student and all middle and high school class sizes by five students this year—and then to double those reductions for the following year. The union also asked for caseload reductions for counselors, nurses, speech therapists and psychologists—all of whom the union also represents. Currently, the OUSD is facing a nurse shortage, with only 22 nurses for the roughly 37,000 students at district-run schools. For Hillary Walker, a teacher at Life Academy, supporting nurses and other staff is a primary reason she’s ready to strike. Without a school nurse, teachers and other staff have are forced to step up and hold “these different roles that are not really in our job descriptions and do so just to keep schools functioning,” Walker said. Increasingly, though, the union has sought to include larger issues affecting Oakland schools in the bargaining process. When the Oakland school board voted earlier this week to close Roots International Academy, a middle school in East Oakland, OEA President Keith Brown told the board that the union was asserting a right to bargain on school closures and threatened legal action to stop the closure of Roots. Speaking later in a phone interview, OEA Vice President Ish Armendariz said that because district staff are saying that they must close schools in order to provide teachers with a raise, the district is inserting the issue of school closures into the bargaining sessions. “It’s now our right and our purview to bargain around [school closures],” he said. In a letter to the community on January 17, OUSD Superintendent Kyla Johnson-Trammel wrote that district officials do not want a strike and that they “are committed to providing our teachers as much support as we can, given our resources.” She wrote that any raise in teacher pay needs to be offset by cuts to the budget—whether that be via layoffs or reductions to programs and services. She highlighted that the district’s financial situation has been improving, but said difficult decisions on trade offs will still need to be made. District staff are projecting a deficit of up to $30 million for the 2019-20 school year. The school board is expected to vote on the first round of budget cuts—about $20 million—in the coming weeks. OUSD communications director John Sasaki did not respond to interview requests by the time of publication. Oakland teachers are considering a strike at a volatile time in public education—teachers all over the country are organizing. Teachers in Los Angeles conducted a six-day strike in January. In Denver, teachers recently voted to grant their union authority to call for a strike in order to increase teacher salary and create a new pay structure. Teachers in Virginia marched for better pay and funding earlier this week. In 2018, teachers in West Virginia, Oklahoma, and Arizona all conducted strikes over similar issues—low teacher pay and slashed funds for education spending. The push to widen to scope of bargaining is partly inspired by the success of the strike in Los Angeles. The United Teachers of Los Angeles (UTLA) received widespread public support during their strike and, ultimately, reached an agreement that met many of their demands, some of which parallel what the OEA has been bargaining for over the last two years—a teacher pay raise, smaller class sizes, and decreased caseload for school nurses. But UTLA also used the strike to push the Los Angeles school board to consider a resolution to place a moratorium on opening any new charter schools. In Oakland, the union says that charter schools are one of the causes of the district’s under-enrollment woes. The OUSD’s primary revenue stream is based on enrollment, so as the district loses students to charter schools or other nearby districts, administrators need to find ways to cut money—generally, either through budget cuts or school closures—to offset this lost revenue. Even though charter schools receive funding from the state like district-run schools, they are not part of the OUSD’s budget. So when an Oakland student leaves a district-run school to attend a charter school, the district loses funding for that student. With nearly one-third of Oakland students already attending charter schools, union officials believe that their continued expansion will lead to more under-enrollment, and, ultimately, more closures of schools like Roots. During the school board vote earlier this week, the primary reason given for closing Roots was its decreasing enrollment over the last few years—reaching a critical level this year that made running the school unsustainable. Roots students, teachers, staff and parents showed up en masse to protest the board’s decision. Armendariz said Oakland teachers were inspired by the strike in Los Angeles—both in terms of the agreement reached by UTLA and the amount of public support they garnered. “Our members are really energized by it. I think it helped make the case that when you strike, you win,” he said. 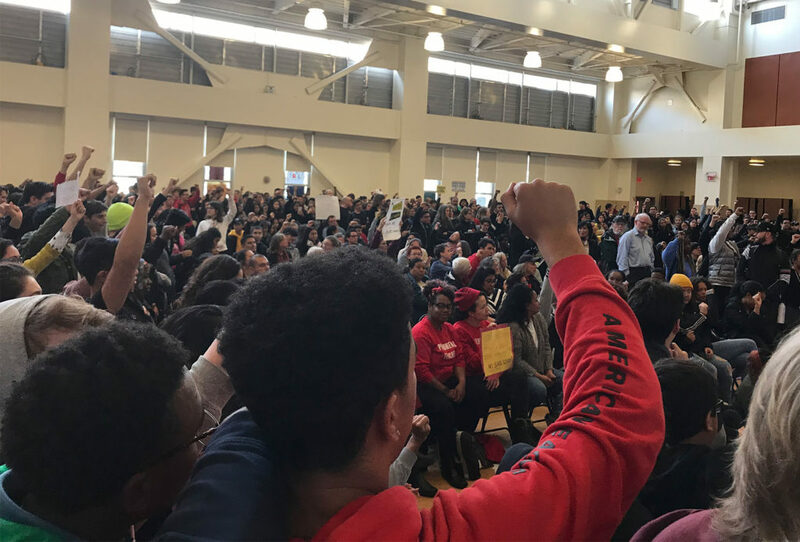 At a community meeting held by Oakland teachers at the EastSide Arts Alliance this week, Chela Delgado, an eleventh and twelfth grade teacher at Coliseum College Prep Academy (CCPA), made a similar argument to the people who had gathered to learn about why Oakland teachers are prepared to strike. Delgado praised the successes of UTLA, saying they did a great job of “building an understanding of the way charters and privatization affect students.” She said she was inspired by the work that union did in building connections with community members and other organizations—the very aim of this meeting. “This is about more than just us as teachers,” Delgado continued in a later interview—to her, it’s about making connections and building a coalition that will challenge the status quo within the district. Oakland teachers and the union have spent the last few weeks attempting to foster support for a possible strike. On January 12, teachers and their supporters marched to Oakland City Hall, where they held a public rally. On the weekend of January 18, the union hosted a three-day art build, at which supporters made signs and banners that could be used on a picket line. At the EastSide Arts Alliance meeting, OEA president Keith Brown addressed the audience, saying that in Los Angeles, the union had a leadership team that spent three years building up community support, but in Oakland, the union’s leadership team has only been in place for six months. That’s why teachers were holding meetings like this, Brown continued, so that members of the community would not only know about the strike, but could strategize about how best to support the teachers. Following the presentation, the audience split into six groups to discuss ways to assist during a strike—supporting picket lines at school sites, applying political pressure to the school board and city council, providing needed resources to families during the strike, organizing students, and spreading the information through house meetings. Brown led the group that was discussing political pressure. He told the group that the Oakland City Council would soon be voting on a resolution to support teachers that would ask the school board to ensure that the district meets the teachers’ demands on pay and class size. He also mentioned the union’s plans for a rally in front of Oakland City Hall on February 5 before the council votes. Community members in the group thought this was a good step, but wanted the union to ratchet up the political pressure even more. The announcement of the strike authorization vote on Friday coincides with a phase of the negotiations called “fact finding.” During this phase, the union and the district each present their proposals to a three-person panel, which is made up of a representative from OEA, a representative from the OUSD, and an independent chairperson that the two parties have agreed upon. The panel is scheduled to listen to those presentations on January 31 and February 1. After the presentations, the chairperson can make inquiries of both sides, hold hearings, or take other actions, including calling everyone back to the negotiating table. If an agreement cannot be reached, then the chairperson will issue an advisory report that states what they found during fact finding and recommends settlement terms. The report is non-binding, but both sides are required to negotiate on its findings. If, again, an agreement cannot be reached, then the OUSD makes a final offer. If the union rejects that offer, they have the right to call for a strike. Armendariz said the union is expecting high turnout for the strike authorization vote this week. “We’re feeling confident that our members are going to vote strongly to authorize our board to call a strike if we deem it necessary,” he said. Oakland teachers held a public rally in front of Oakland City Hall on January 12. Hundreds of people gathered to support teachers and demand more funding for public education. Photo courtesy of OEA.